Are you an undergraduate student in Columbia College, SEAS, Barnard College, or GS? Apply to join the board of the oldest college literary magazine in the country! Once a week, the editorial board of The Columbia Review meets to discuss submissions for publication in its magazine, which prints once a semester. We have drinks and snacks, and talk about poetry, fiction, and other art and writing. It’s a grand old time. Throughout the year, The Columbia Review holds open mic nights, fundraisers, release parties, and more. And, starting later in September, The Review will also be publishing work of all kinds online. Sound like the place for you? 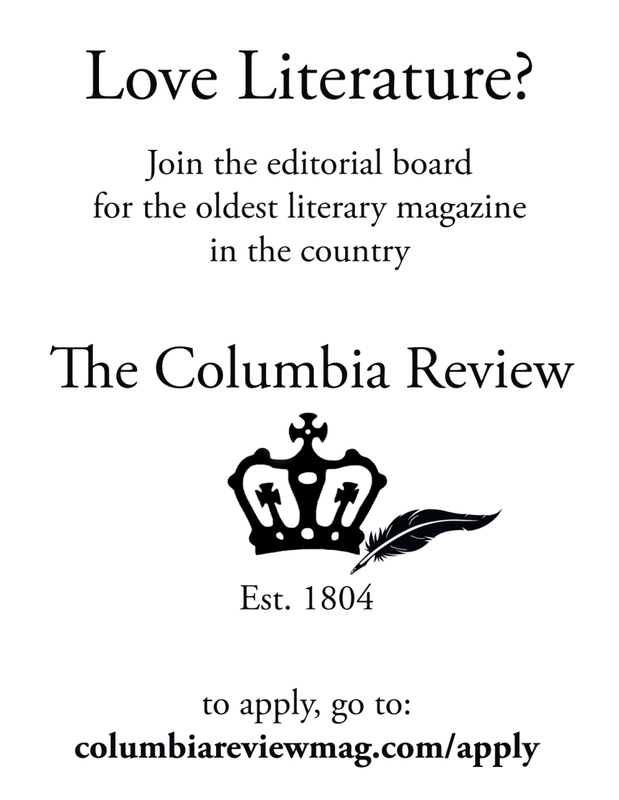 Simply fill out the application below and email it to the editors at TheColumbiaReview@gmail.com. Following the online application, there is a round of interviews for select applicants. Due to the volume of applications we receive, we are unable to offer interviews to all of those who apply. For more information about the magazine, please explore the rest of the website. For information specific to the application process, please look at the application below. If you have any further questions, please reach out to us at the email address above, TheColumbiaReview@gmail.com. Applications are due Thursday September 11th by 5 PM! Don’t miss out!